This year, however, the blossoms had already fallen away on the day of the the NYU-GAKUSHIKI – giving commemorative photos very different look! It`s like deja-vu all over again. Just two weeks or so after you had seen the families- usually consisting a father, mother and single child – all dressed in their Sunday best – on their way to or from March graduation ceremonies held at kindergartens, elementary schools, junior-high schools, high-schools or universities, you saw similarly dressed families- sometimes the very same people – on their way to or from schools, as the cherry blossoms of April bloomed overhead (or as in 2018 – with the fresh spring greenery exploding all around!). Don`t worry. It is not your mind playing tricks on you! These families really have gotten all dressed up again (and fathers have taken another day off from work!) 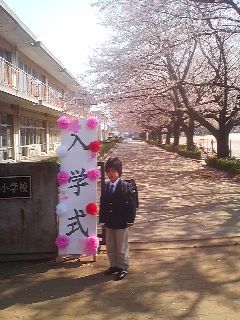 so soon after graduation- because early April – (normally) the cherry blossom season in much of Japan – is also the Entrance Ceremony Season, at kindergartens, schools, universities and companies. Entrance ceremonies? Thats right- and except for Kindergarten Entrance Ceremonies- they always takes place took weeks or so after a graduation of some sort ! That means your Elementary School Entrance Ceremony comes right after your Kindergaten Graduation, your Junior High School Entrance Ceremony just after your Elementary School Graduation, your High School Entrance Ceremony soon after you J.H.S. 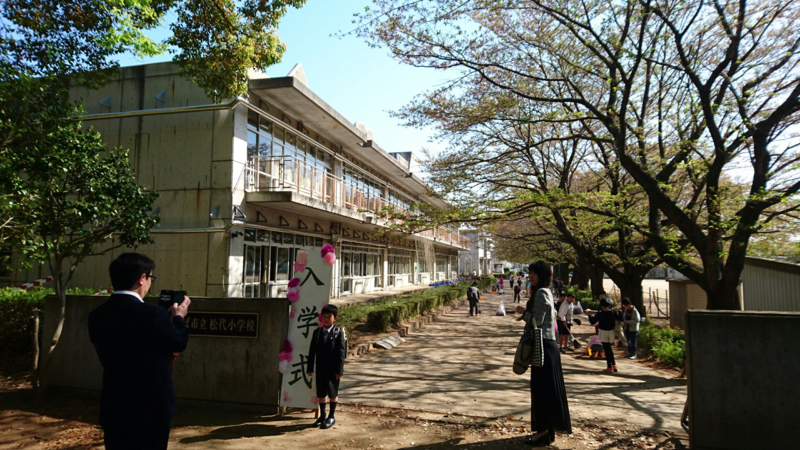 Graduation, and you University Entrance Exam – often extravagant affairs- Nihon University`s Nyu-gaku Shiki is held at the Budokan Hall in Tokyo, and Company Entrance Ceremonies(parents sometimes even attend these in recent years!) just after College Graduation! 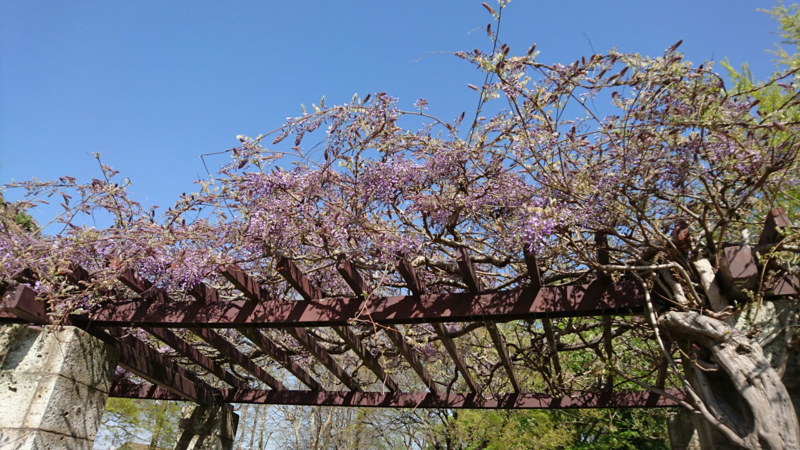 In 2018 not only were the cherry blossoms gone by the day of the Entrance Ceremonies in Tsukuba – but the wistaria were already in bloom! In traditional Japanese culture, beginnings ( as well as endings) are taken very seriously. To help guarantee success, new undertakings must be given a PROPER start – with appropriate equipment (preferably new and expensive) and uniforms, auspicious greetings and positive attitiudes. Entrance Ceremony in Tsukuba. While until about 15 years ago only mothers attended graduation and entrance ceremonies, it is now VERY common for both parents ( and sometimes grandparents, as well) to attend. 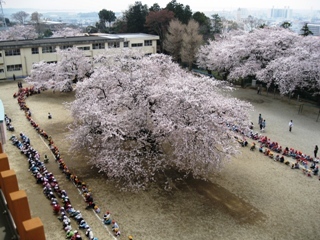 In Japan there are two great seasons for clean beginnings- New Year`s (with both end-of- the-year ceremonies parties in December and New Year`s parties in January) , and then the beginning of the new school and business years in April- as the cherry trees bloom- shortly after March graduations. 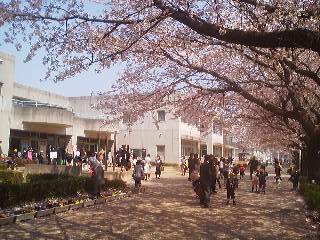 What is the connection between cherry blossoms and new beginnings? 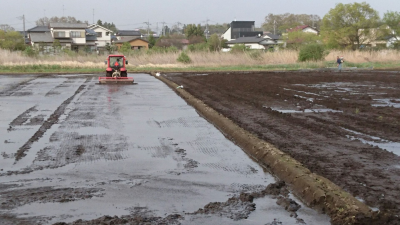 Well.the foundation of much of Japanese culture is the cycle of rice cultivation. 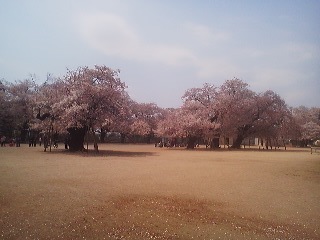 The cherry trees happen to bloom just before the beginning of the new rice production season. 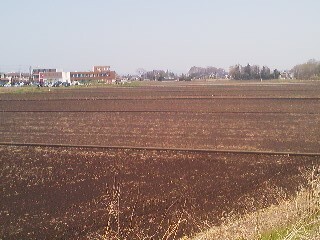 Because of this, ancient farmers felt that there was a connection between the blossom`s of these trees and the miracle the growth of their rice. That is why they ate and drank, danced and sang under these trees – as a prayer and rite to help ensure successful harvests. Blossoms were also closely examined in order to predict the quality of that year`s crop. 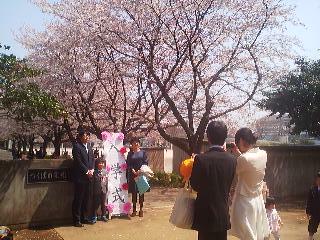 These ancients customs eventually evolved into what are now Japan`s HANAMI cherry blossom viewing parties. And that is how cherry blossoms came to be associated with beginnings. Today too, as Entrance Ceremonies of all sorts were being held, farmers nearby were readying their rice fields for flooding and transplantation. 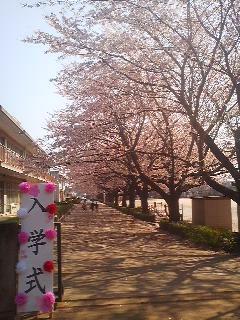 There are five grand 100 year-old cherry trees at Manabe Elementary School in Tsuchiura. Living and working in Japan can require a lot of patience- especially for dealing with all the overly long (and often boring) meetings which one must so frequently sit through. Kindergarten and Elementary School Entrance Ceremonies give 4 year-olds and then six-year olds their first lessons in patience and endurance. Dressed in stiff formal wear, children and parents (and sometimes grandparents, as well) sit for up to two hours while principals, teachers and local politicians give speeches. Its even difficult for me to sit though one of these events without fidgeting (or going insane!) – so I realize that for energetic little kids, it is a true baptism by fire into the Japanese world of meetings, ceremonies, and formalities. Something else which will surely come as a surprise (or should I say shock!) to any foreigner whose children must take part in these ceremonies is how much money must be spent for these new beginnings! The requisite school bags (called RANDOSELL) alone cost on average 35,000 Yen (350 Dollars). Most families spend ￥50,000 on one！　And remember that that is just for the bag! Brand new, top quality equipment is considered a first step to any serious endeavour- a concept which has always been very helpful in keeping business brisk in Japan ! This is especially noticeable when students enter college, parents have to go on serious shopping sprees buying furniture, televisions, stereos, computers etc. – all brand new (while in most other countries, college students make do with old things they bring from home, hand-me-downs, or thrift shop items- even if they are from families with money). For elementary school or kindergarten students, after all the new necessary supplies have been purchased, names must be painstaking written on each item – each pencil, each crayon, each card. It is a time consuming and painstaking process- but carried out with plenty of affection in the belief that this effort will somehow get the new students off to a successful start. 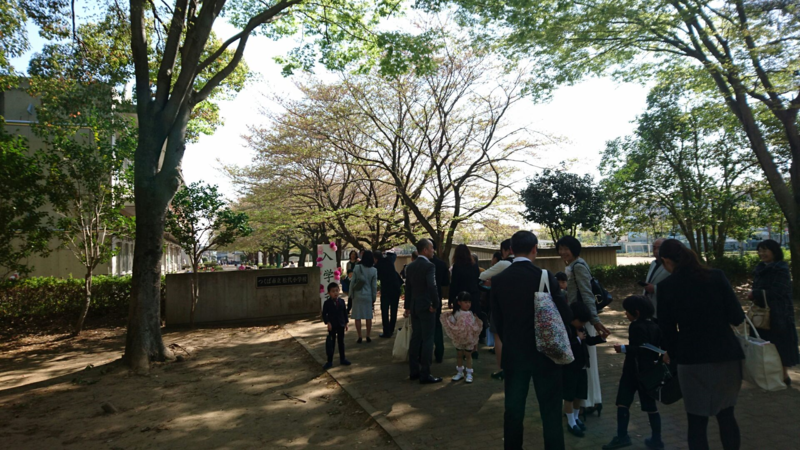 Interestingly, while so many things traditional have been losing their places of importance in contemporary Japan, Entrance Ceremony stock has been rising. Where 10 or 15 years ago it would be just the moms who attended these events, it is now almost always both parents who attend.- and as I`ve mentioned above, there are even cases of proud parents attending their 20-something childrens` company entrance ceremonies. Older Japanese, especially men, will probably laugh out loud if you tell them that ! There was an item in all the papers this year which raises some interesting questions about ethical questions about school entrance ceremonies. 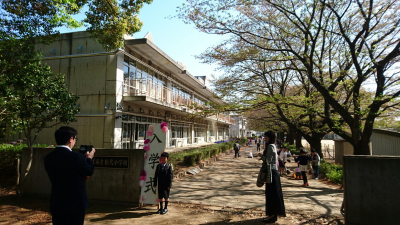 Apparently, there was a high school teacher, who felt that it was was so important to attend her son`s high school entrance ceremony that she decided to ask her principal if she could be absent from her school`s ceremony so that she could attend her son`s, at another high school. This created a scandal, as the parents who came to her school`s ceremony were outraged that their children`s teacher was not in attendance. She was also criticized for her decision by her local board of education. I did may own little survey about what people felt about this teacher`s actions and learned that most felt that the teacher lacked professionalism. There were a few- including some retired teachers who sympathized with her desire to be at her son`s ceremony, as they had missed their children`s ceremonies- and regretted having done so. When you think about it, though, if her son`s entrance ceremony was so important to the teacher, what would she have felt if his teacher hadn`t been there – because she had wanted to be at her own child`s ceremony?